“Analemma”—choreographer Evalina Carbonell. Scored to sensually quirky music by Lucky Dragons, one of Carbonell’s most intriguing works, danced by Weiwei Ma and Frank Leone, Carbonell’s colleagues from Kun-Yang Lin/Dancers. Ma and Leone move around each other in intimate dance flirtations that melt to turmoil and abstract expression. The dancers mirror each others idiosyncratic moves, At one point she breaks away only to fly across the stage and jump on Leone’s back, later she lifts him protectively, then disengages herself, leaving him in frozen in that position. In one dramatic moment, Ma dances with rapturous esprit, as Leone is crawling toward her like he was inching across a mine-field. Throughout, these dancers build a hauntingly beautiful emotional intimacy as Carbonell’s choreography continued to hypnotize. For Dance Company—“Dali’s L’Angelus”—Choreographer Christina Elrvedt and Avi Wolf Borouchoff are perched on two wood ladders that represent trees. Are they avians? Mythological gods? or both. Avi is injured and drops to the floor, Elrvedt moves in and starts to attack. She clamps her legs around his body and her arms severely angled, like a great bird, she mounts him, she hoists him on her back, and carries him off, but he recovers enough to claw away and they both return to their perches. Survival of the dance fittest be depends on one’s world view. Kariamu & Company: Traditions—“Entangled”—Choreographer Kariamu Welsh. A solo scored to Nina Simone’s riveting vocal Wild Is The Wind and danced by the electrifying Shaness Kemp. Kemp is in dramatic silhouette to introduce the character of the ballad about a torrid love affair. Andrea Carter’s gorgeous costume design of a steely grey day dress with multi-color shredded fabric dangling. Welsh’s movement is a fusion of modernist movement and ballet precision, Kemp presence and technical artistry electrifying. Nickerson Rossi Dance—“Apropos”—scored to cinematic music by Ludovico Einaudi. Choreography Michael Nickerson-Rossi’s ballet solo that also broke away in moments of modern movement. Dancer Chad Allen Ortiz works impressively in adagio, every position polished. Ortiz’s expressive hand choreography hinted at flamenco and he was almost on barefoot pointe more than once, before dramatically lunging to the floor. 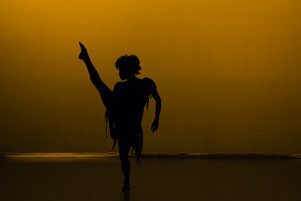 Eleone Connection —“Hosanna”—20 Eleone dancers ignited the stage for Hosanna, choreographed by Wayne St. David and Eleone artistic director Shawn-Lamere Williams. Scored to a rousing spiritual by Kirk Franklin, the piece is signature Eleone. The women in white danskin gowns and the men in tights, surge across the stage in a fireworks display of jetes, unison turns and pulsing rhythmic ensembles. With each configuration, the patterns get more intricate and the pacing more thrilling. This was a rousing closer to a thoughtful and heartfelt benefit concert.